Synthetic Genomics (SGI) Scientist, Katie Lyons, recently spoke at the 2016 Synthetic Biology: Engineering, Evolution, and Design (SEED) conference in Chicago. For those who were not able to make it to hear the talk, here is a summary of her presentation. Historically, life science researchers have been completely dependent on a template. If they were lucky, researchers could get a template from a culture collection or from a fellow researcher; otherwise, they would go bioprospecting to the ends of the earth (or Mars) for their samples. 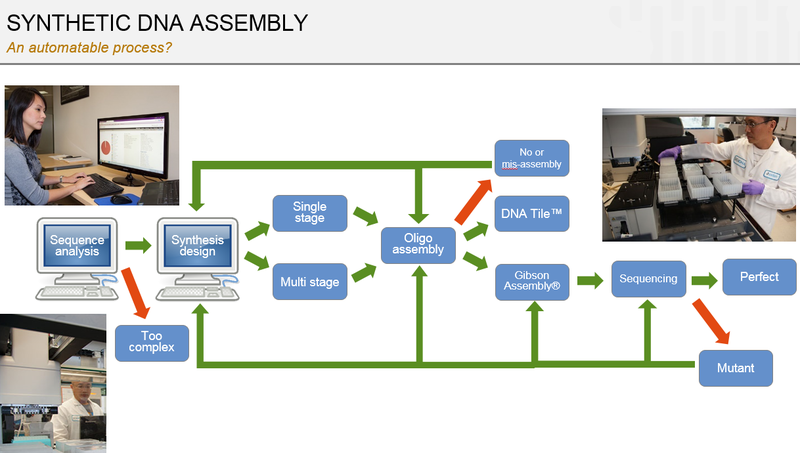 With recent advancements in synthetic biology, all you need today is a sequence. Next generation sequencing has enabled a wave of information to be made readily available. Lyons quipped “Now you may need to curb your enthusiasm when you design your experiments.” She cited three major milestones for synthetic biology from J. Craig Venter Institute (JCVI) and SGI labs: first synthetic genome of Mycoplasma genitalium; the first self-replicating cell – Mycoplasma mycoides; and the first minimal bacterial genome. “All of this was done by people with great hands, spending a lot of time doing the work,” said Lyons. All of these advancements led to a need to automate key processes. 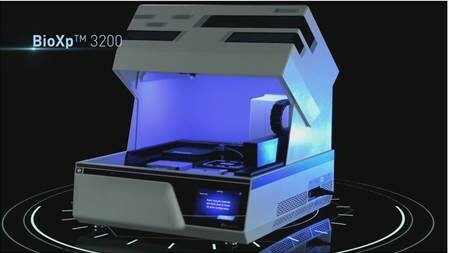 We have reached a point where machines, such as the BioXp™ 3200 System, can do this work instead: build oligos to genes overnight. Lyons spoke about the key considerations for building genes in today’s world of automation. The BioXp™ System’s analytical tools are designed to make decisions based on the sequence characteristics and, while the machine itself is capable of complex processes. It yields predictable and reliable results, and it is user friendly, so that any lab working with DNA would be able to use the machine. But most importantly, the machine is adaptable, and new protocols are being continually modified and improved upon. What happens inside the box? 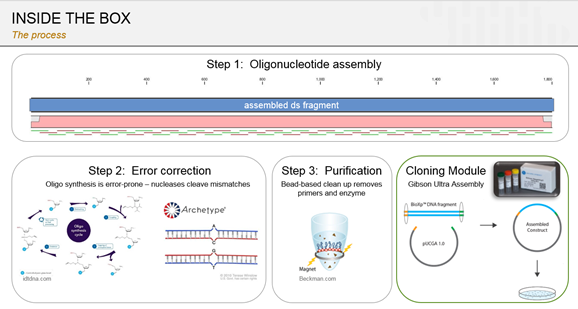 Oligonucleotide assembly, error-correction, to purification. Since its launch in 2015, SGI-DNA has added cloned plasmids to the product offering. Lyons announced the newly expanded complexity feature, which means that the machine is now able to build a wider range of sequence types: 20-70% GC content for 400 bp to 1 kb and 40-60% GC content for 1-1.8 kb. Next on Lyons’s to-do-list: working on higher fidelity, improved target yields, larger construct size, and expanded downstream capabilities. Giving a real world example of how powerful this process can be, she spoke about the H7N9 influenza outbreak in 2013. Rather than wait for the virus to make it to the US from China, researchers at JCVI used the sequence information that was available online and began to synthesize the genes de novo. Gene synthesis took less than 24 hours and they had viral seeds well over a week before CDC received wild type virus from China. Lyons calls this rapid response a game changer. 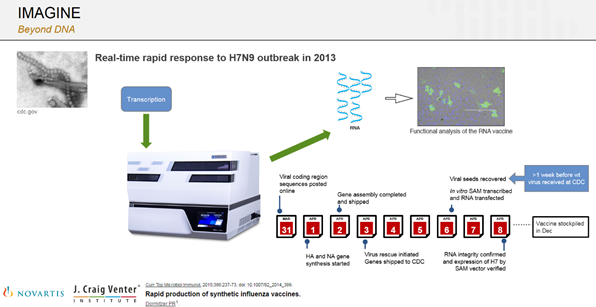 This process allowed for the vaccine to be stockpiled in December before the second wave of the virus hit. Now with the BioXp™ 3200 System, this process can become even more efficient. Since its launch, the BioXp™ 3200 System has continued to evolve, expanding its capabilities. The world has not seen the end of what this machine is capable of. Lyons concluded her talk by saying, “It does not escape my attention that I am building my replacement… I have 4 machines on my bench that do all my work for me all the time now, and I would not trade them for the world.” With the BioXp™ 3200 instrument, rather than trudging through the weeks of tedious protocols, scientists are now freed to focus their energies on thinking about strategy and the next steps of their experiments. Katie Lyons is a scientist in the DNA Technologies group at Synthetic Genomics (SGI), tirelessly working on developing new features for the BioXp™ 3200 system. This is an advanced work indeed. We were just studying the structure of DNA and genetics and searching for some research paper writing website and what you have here is beyond from what I've learned so far. I will definitely include this in my paper.